I'm not positive but I'm pretty sure this year marks the 20th year I've been commuting by bicycle to work. Sure, that statement dates me and if I count commuting to school by bike too, its been over 30 years. 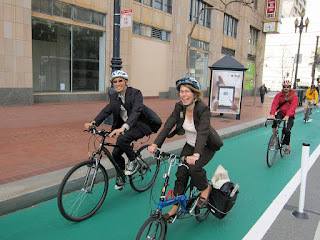 Are you interested in bicycle commuting or just think I'm crazy to have done it for so long? Well read on because I'm going to share a little wisdom and a lot of common sense on how it's done. 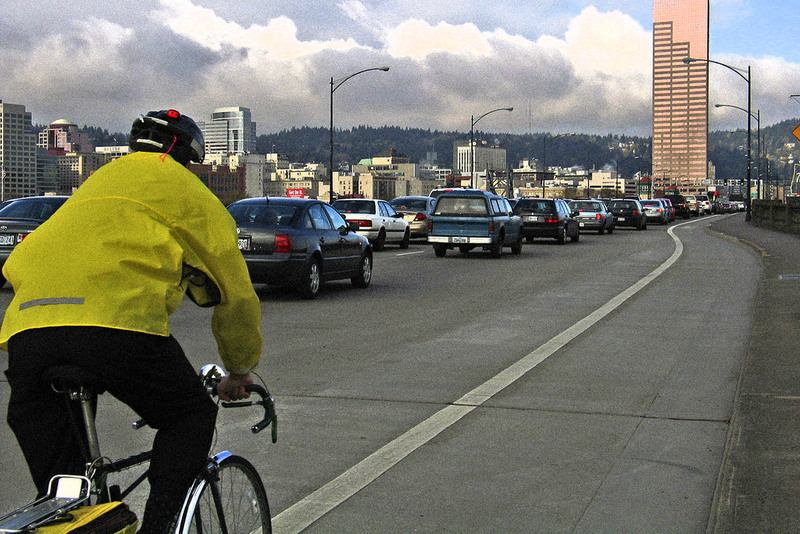 First and foremost, when you're job searching or home searching, make the commute a priority! 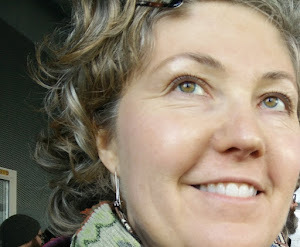 When I moved to Portland, Oregon back in the late 80s I had a job. I knew where I was going to work so when I was looking for a place to live, the number one priority was that I was close to work; less than 5 miles. Since initially moving here, I've lived in five different places, but none farther than 5 miles from work. I could probably stop here as this really is the most important part of bike commuting, however then I wouldn't get to talk about the fun stuff, like the bike and gear! Let's start with the bike. You're going to want a comfortable and safe bike. Over the years, I've commuted on 5 different bikes (really, there's no theme of 5 here) and I've concluded that the most comfortable, responsive rides I've had are on bikes with steel vs aluminum frames. Having never owned a titanium framed bike, I can't speak to them. Also important and simply weren't around when I first started bike commuting, are disc brakes. Seriously, these are a game changer for bike commuting especially in wet conditions. They allow you to stop much quicker than bikes using caliper or cantilever brakes and the upkeep is much easier. Twice a year I get my bike tuned up and they adjust the disc brakes and install new pads if needed. I think I've only replaced the pads on the disc brakes once or twice in 6 years, in comparison, old style brakes go through pads every couple months. Aside from the bike, there's a litany of accessories to buy for it and most are personal preference except fenders, lights, and a helmet. 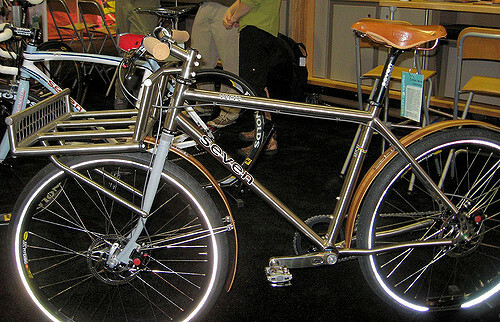 Fenders are a necessity if you're ever, ever going to ride in the rain. They will keep your backside dry and just as important, keep you from being the a-hole rider that spews water onto everyone behind them or passing them. You don't want to be THAT rider and because of that, opt for fenders that cover most of your back tire. For me, since most of my route to work is well lit and I'm not riding in complete darkness, the lights on my bike are more for others to see me rather than for me to see where I'm going. Therefore, I opt for a simple front white blinking light and a red back blinking light. Both these lights have the option of not blinking but blinking lights let drivers know you're a bike and they can plan accordingly. I also like that these lights take simple AA batteries and not some fancy battery you have to run to a special store to get. 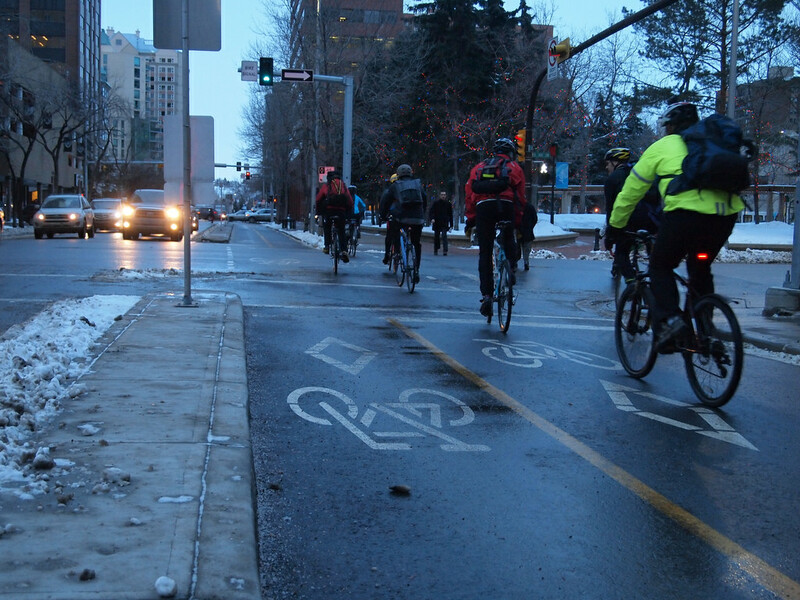 A helmet is just common sense, especially if you ride in increment weather. You can spend as little as $15 or as much as you want. I've crashed 3 times on ice and each time I fell and hit my helmet on the concrete before I even knew what happened. It was quick and there was no way I could have kept my head from hitting the ground. After a crash, it's always important to replace your helmet, they're only meant to withstand one blow. Oh, and by the way, don't try riding when it's icy out. Take the bus or work from home. What you wear to commute in, as long as you followed my advice and aren't commuting 40 miles, is really up to you. 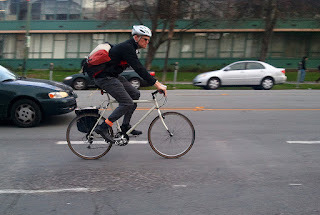 As work environments become more casual, I see more and more people wearing their work clothes on their bike and that's certainly how most Europeans commute by bike. Regardless, one thing you'll want to invest in is a good, reflective rain jacket one that will keep you dry from the rain on the outside and not trap the sweat on the inside. Along that same line, on really rainy days you'll probably want some rain pants. 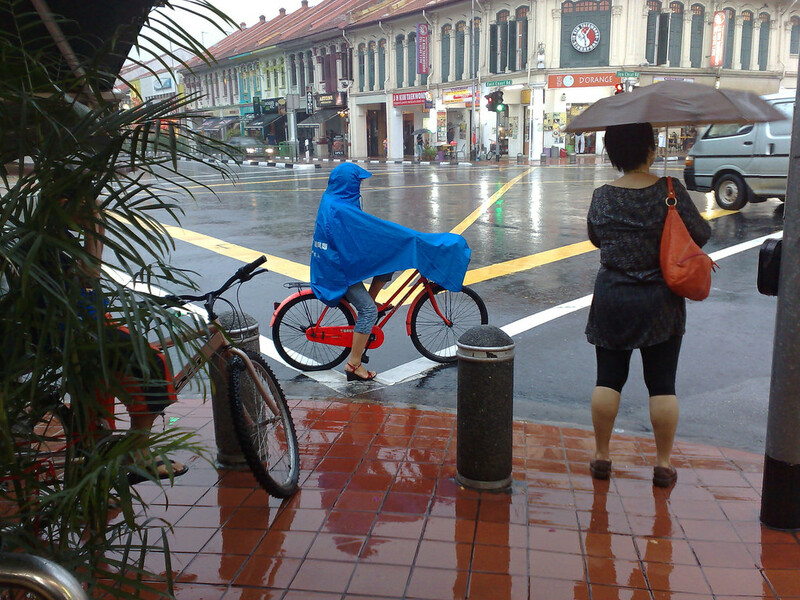 The past couple of years, I've been using a bike poncho to commute in wet weather. I prefer this to rain pants as I find rain pants slip around on the bike seat. I also recommend, for those really rainy days, a pair of shoe covers. They're not expensive (I've even seen people just rubber-band some plastic bags around their shoes) but are worth it. There are plenty of other accessories you can buy and are important (like gloves and ear muffs) however, you'll probably find over time what you need and like. 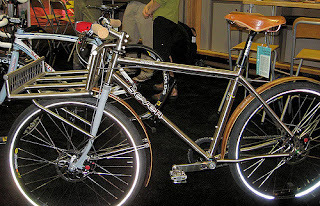 Early on in my bike commuting, I used a rack on my bike with panniers. I've since migrated to just using a messenger bag and find I like it better. How to ride safely, is more important than any gear you buy. 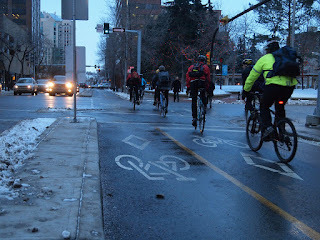 It takes a long time to feel comfortable on a bike in traffic. It's important to always be visible and that means riding in the lane with cars if you're on a street with a traffic speed of 35 mph or less (and you should be.) You don't need to take all the lane, but don't hang out so far on the shoulder that you have to swerve in and out of traffic to get around parked cars. It goes with out saying that when you're on a bike you're vulnerable. Your best line of defense is to act predictable which means follow the traffic laws, stop at stop signs and red lights, take your turn at four way stops, signal when turning and changing lanes, and ride in a straight line. The best advice I can give for bike commuting is simply to try it. You'll discover over time what works well and what doesn't work but just try it. And now if you've stuck with this post long enough to get to the end, for your viewing pleasure, here's a (bad) video of my commute. If you're still reading...don't forget it's not too late to order Lora's Beauty Goats' Milk Soaps for the holidays! They make great gifts for everyone on your list and with free shipping on orders over $30 in the US you can't go wrong! "Watch the door zone. Drivers forget to watch for bikes when opening car doors. 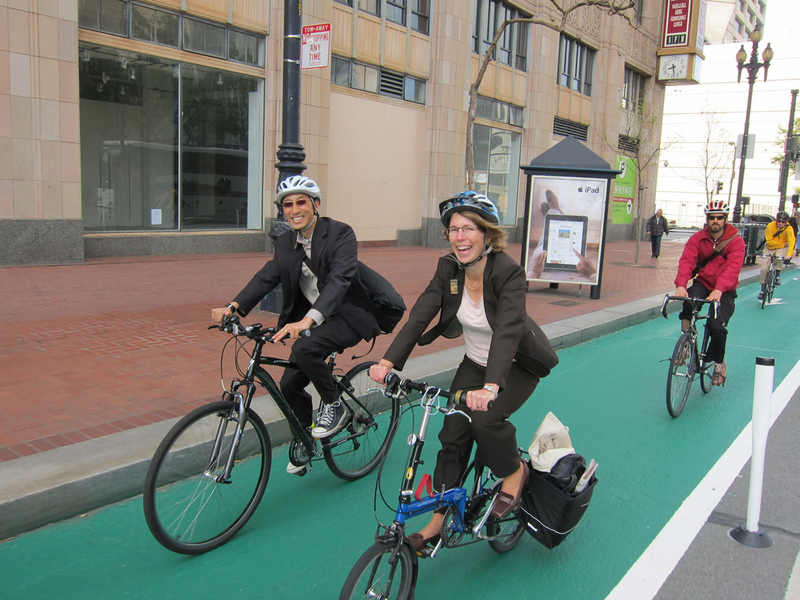 ORS says it’s OK to ride 3’ away from parked cars." Good advice! I recently added a bluetooth speaker to my bike and can listen to the news on my commute. It also has a horn/bell built in. As somebody that commutes on semi-rural roads I can't say enough about a good headlight (or even two). This goes beyond just being visible to actually helping light the road. A bigger/brighter light also seems to keep cars from turning on their brights to see what I am. And I agree with Moss; ditch the sweaty backpack and get a rack bag or panniers. My rack bag is where I mount my rear light so when I take it off it gives me a chance to charge the light as well and not forget it on the bike. Oh a speaker! That's cool! Thanks for the comment and great input. I completely agree about a good light when you need to see where your going. Great article Deann! As a daily bike commuter here in Perth (can't claim 30 years though...!!) I agree totally with your "distance to work" comments. On the bike I can often beat my "driving to work in peak hour" commute time... And my excellent "Showers Pass" rain jacket (purchased many years ago on a visit back to Portland) is still going strong - although we don't get anywhere near the amount of rain here in Western Australia compared to Portland! Hi Antony! Thanks for reading and commenting. Glad to hear you're commuting by bike too. I agree, if you live close enough you can often beat your drive time on a bike. 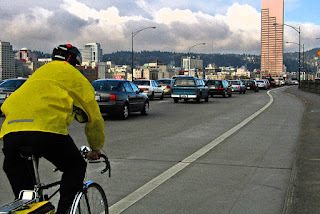 In fact, there was one year in Portland they had a contest where between a car, cyclist, and bus rider who all left from the same spot at the same time. The cyclist made it to the destination spot first.